For centuries, the bald eagle (Haliaeetus leucocephalus) was a spiritual symbol for the native people who lived in the United States. 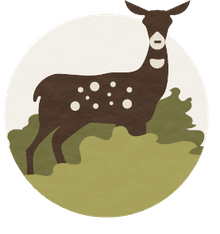 And in 1782, it was nominated as the national emblem of the U.S., but it nearly became extinct in the 1970s due to illegal hunting and the effects of DDT poisoning. Recovery efforts and stronger federal protection helped ensure that this large raptor is no longer endangered and continues to make a strong comeback. The bald eagle's head may appear bald, but it's actually covered in white feathers. Indeed, its name is actually derived from an older name and meaning of "white-headed." The "bald" heads of mature bald eagles contrast sharply with their chocolate brown bodies. They have a very large, yellow, thick bill with an upper mandible that is strongly hooked. They are generally 35 to 42 inches long with a wingspan that can grow to 7 feet or more. The head, neck, and tail of bald eagles are bright, plain white, but younger birds may show spotting. Their eyes, bill, legs, and feet are yellow, and their black talons are thick and powerful. The bald eagle's range spans from Mexico to most of Canada and it includes all of the continental U.S. They can be found in all kinds of habitats from the bayous of Louisiana to the deserts of California to the deciduous forests of New England. It is the only sea eagle that is endemic—or native—to North America. 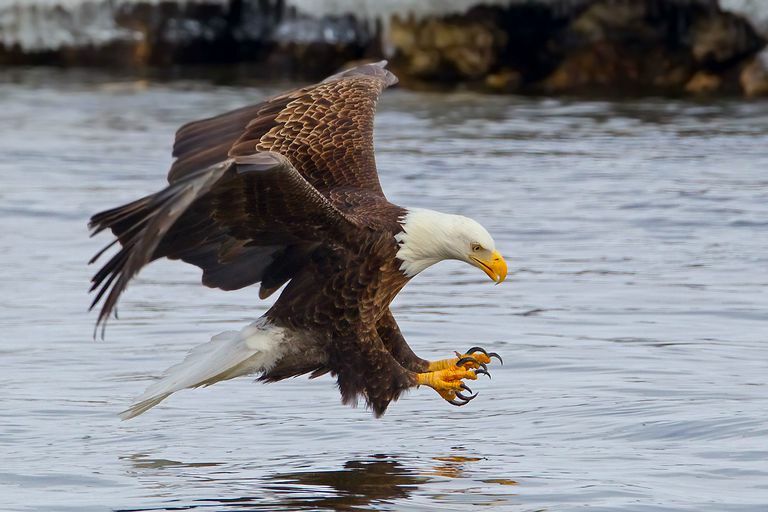 Bald eagles eat fish—and anything and everything else—but fish make up the majority of their diet. The birds have also been known to eat other water birds such as grebes, herons, ducks, coots, geese, and egrets, as well as mammals such as rabbits, squirrels, raccoons, muskrats, and even deer fawns. Turtles, terrapins, snakes, and crabs as make for tasty bald eagle snacks as well. Bald eagles have also been known to steal prey from other predators (a practice known as kleptoparasitism), to scavenge carcasses of other animals, and to steal food from landfills or campsites. In other words, if a bald eagle can grab it in its talons, it will eat it. Bald eagles mate from late September to early April, depending on the region. The female lays her first egg five to 10 days after mating and incubates the eggs for about 35 days. They produce one to three eggs, which is called the clutch size. When first hatched, bald eagle chicks are covered with fluffy white down but quickly grow larger and develop mature feathers. Juvenile birds have mottled brown and white plumage and do not get the distinctive white head and tail until they are 4 to 5 years old when they are sexually mature and able to mate. Bald eagles today are threatened by poaching and accidental or deliberate shootings, as well as other risks to raptors including pollution, collisions with wind turbines or power lines, contamination of their food supplies and habitat loss. Lead poisoning from fishing lures and discarded bullet casings is also a grave threat to bald eagles and other large raptors. The International Union for Conservation of Nature lists the bald eagle's conservation status as "least concern" and says its population is increasing. However, bald eagles were severely affected by pesticides and persecution in the 1970s and 1980s, reaching endangered status. Strong efforts to restore these birds were successful and the bald eagle was removed from the endangered species list in 2007. “Bald Eagle Overview, All About Birds, Cornell Lab of Ornithology.” Overview, All About Birds, Cornell Lab of Ornithology. “Bald Eagle.” National Geographic, 21 Sept. 2018. “Basic Facts About Bald Eagles.” Defenders of Wildlife, 10 Jan. 2019. “The IUCN Red List of Threatened Species.” IUCN Red List of Threatened Species.